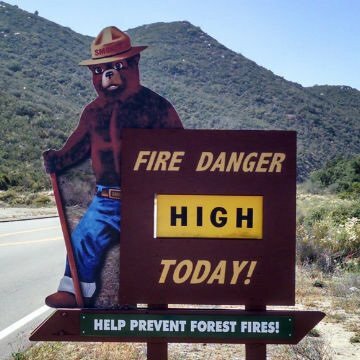 Most people don’t realize that they face serious wildfire danger, but if you live in the foothills, grasslands, or mountains of Colorado, you are at risk. With the lack of snowfall and almost no rain this spring, we should be on high alert for wildfire danger this summer. Durango is already experiencing a large wildfire that has burned more than 20,000 acres and with only hot and dry weather in the forecast, it is expected to be a multi-week effort to contain it. Although wildfires are mostly out of your control, there are many things that you can do to help reduce the risk and protect your home and your forest this summer. The majority of homes ignite during a wildfire due to embers or small flames that get carried through the air. Embers are burning pieces of airborne wood and/or vegetation that can be carried more than a mile through the wind and can cause spot fires, igniting homes, debris and other objects. There have been many experiments done and models created to show that homes ignite due to the condition of the home and everything around it. This is called the Home Ignition Zone. The Home Ignition Zone is a concept, which includes the structure and the space immediately surrounding the structure. A retired USDA Forest Service fire scientist, Jack Cohen, developed this concept in the late 90’s. The Home Ignition Zone is divided into three zones. Below are descriptions of the zones along with some tips for taking care of them. Immediate Zone: This includes the home and the area 0-5’ from the furthest attached exterior point of the home, also known as the non-combustible area. This zone is the most vulnerable to embers. It is advised to start with the house itself and then move into the landscaping section of the Immediate Zone. • Clean roofs and gutters of dead leaves or debris that could catch embers. • Repair or replace damaged or loose window screens in areas below patios and decks with wire mesh to prevent debris and combustible materials from accumulating. • Replace or repair any loose or missing shingles or roof tiles to prevent ember penetration. Intermediate Zone: This zone is 5-30’ from the furthest exterior point of the home. This zone focuses on landscaping/hardscaping, which helps to decrease fire behavior. • Clear vegetation from under large stationary propane tanks. • Create fuel breaks with driveways, walkways, patios, and decks. • Tree placement should be planned to ensure the mature canopy is no closer than ten feet to the edge of the structure. Extended Zone: 30-100 feet, out to 200 feet. The major goal in this zone is not to eliminate fire, but to interrupt the fire’s path and keep flames smaller and on the ground. • Dispose of heavy accumulations of ground litter/debris. • Remove dead plant and tree material. • Remove small conifers growing between mature trees. • Remove vegetation adjacent to storage sheds or other outbuildings within this are. Educating your children on fire safety can be just as effective as preparing your home against wildfires. With kids on summer break it is important to remind them about the dangers of playing with fire and also prepare them in case of a fire emergency. • Make a home fire escape plan and practice it at least twice a year with your children. • Teach children to never go back inside a building that is on fire. • Keep children 3 feet away from anything that can get hot such as fire pits, personal fireplaces, and torches to prevent fires and burns. • Keep smoking materials locked up in a high place. • Never play with lighters or matches when you are with your children. We encourage you to use these tips to help keep you and your family safe this summer and to keep the wildfire danger down in our beautiful state. If you have any questions, as always, feel free to contact your friends at the Carbondale Fire District.